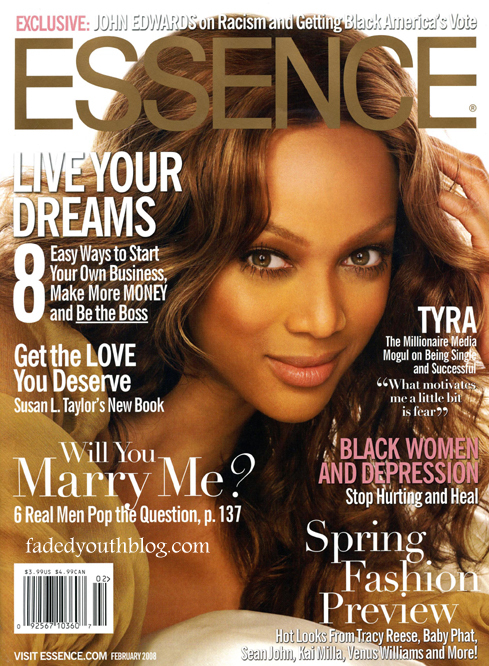 After relaunching their website last week, Essence magazine laid off its web team today citing budgetary reasons. In addition to letting go of the web team, Essence also let go of some magazine staffers. The site’s managing editor, Emil Wilbekin, is still on staff. Steven Psyllos, deputy editor for Essence.com remains as does the photo editor. Otherwise the ENTIRE web team is gone, appx 12-15 ppl. 4 cuts from Essence staff include: Fashion Assistant,Work & Weath Assistant, one of 3 deputy editors and a special projects director who’s been with the magazine since the 70s. I think it was only a matter of time.. Their readership has aged with the magazine so they should do something different to reach a younger generation. This doesn’t surprise me, essence needs to reinvent themselves somehow. most readers want to read garbage and that’s whats selling. They should start their own magazine and use the knowledge they have to benefit themselves. I am overjoyed! That Web site is one of the worst run in the biz. My good friend applied for a position there and big surprise, received no response to her resume — mainly because they are not big on hiring the best and brightest over at Essence. RIP. Emil, you’re next! Where I have been able to read about it? Excellent post. I used to be checking continuously this blog and I’m impressed! Extremely useful info specifically the final part :I take care of such info a lot. I was seeking this particular info for a long time. Thank you and good luck. It is extremely useful for me. Big thumbs up for this blog post! Hi there, You’ve done an incredible job. I will certainly digg it and personally suggest to my friends. I’m sure they will be benefited from this website. I as well as my guys ended up looking through the best procedures from your web page and quickly I had a horrible suspicion I never expressed respect to you for those techniques. Those ladies are already as a consequence thrilled to see all of them and have now actually been taking advantage of these things. Appreciation for actually being considerably considerate and also for opting for variety of impressive themes most people are really desperate to learn about. My sincere apologies for not expressing appreciation to you sooner. part of community where I can get advice from other experienced individuals that share the same interest. like WordPress or go for a paid option? There are so many choices out there that I’m totally confused ..
goes along with your thoughts about this web site. on world-wide-web I found this web site as a best website for latest updates. I and also my friends have already been looking at the nice tricks located on the blog and then suddenly developed an awful suspicion I had not thanked you for those strategies. These ladies had been as a result passionate to see all of them and now have unquestionably been enjoying these things. I appreciate you for being well considerate and for finding these kinds of ideal subject matter millions of individuals are really needing to be aware of. My personal sincere regret for not expressing appreciation to sooner. I needed to put you that very little observation so as to thank you so much yet again for your unique tips you have shared here. This has been simply remarkably generous with you to provide unreservedly what many of us could possibly have offered for an e-book to generate some profit for themselves, specifically considering that you could possibly have done it in case you desired. These ideas in addition acted to become great way to be aware that some people have a similar keenness the same as my very own to know whole lot more in regard to this problem. I know there are a lot more enjoyable times in the future for individuals that discover your blog. I happen to be commenting to make you be aware of what a wonderful encounter my wife’s girl had checking the blog. She came to understand many issues, not to mention how it is like to possess an amazing helping mindset to let the rest effortlessly have an understanding of certain problematic subject matter. You truly exceeded readers’ expectations. I appreciate you for coming up with those productive, healthy, revealing as well as unique tips about this topic to Emily.